Just about every company paying a dividend yield has had extremely strong stock gains over the last year. Main Street Capital Corporation (MAIN) has been no exception to this rule. Though the company continues to raise the dividend, the current yield has dropped to 6%. The company is a principal investment firm that primarily provides long-term debt and equity capital to lower middle market companies and debt capital to middle market companies. Now that the company has gained 69% over the last year, the question remains whether investing in a BDC that only pays a 6% dividend is worth it. The company has a primary focus in the lower middle market that has a favorable investment opportunity as fewer lenders have competitive offerings for this sector after the financial crisis. After reporting Q3 earnings, Savient Pharma (SVNT) plummeted back to a $1 from the meteoric rise to nearly $3 during the quarter. The company reported disappointing sales numbers for the promising gout drug and failed to break out one-time costs to provide investors a clearer picture of the 2013 earnings view. As written in a previous article, Savient Pharma: The Pharma Rising From The Dead, the company was able to complete a restructuring that provided time to build the revenue base. While all of those moves left the company better equipped to survive long enough for the promising new drug to thrive, Savient has yet to prove to the market that the drug will ever meet the original estimates. Will the lowered cost structure even be sufficient enough to survive? The company is a specialty biopharmaceutical company focused on developing and commercializing KRYSTEXXA (pegloticase) for the treatment of chronic gout in adult patients refractory to conventional therapy. When Document Security Systems, Inc (DSS) announced plans to merge with Lexington Technology Group, Inc (LTG), the company signaled a shift in business plans to focusing on monetizing IP assets. With DSS in the process of a lawsuit against Coupons.com over misappropriated trade secrets and breached confidentiality agreements, the merger with a manager of IP assets appears to provide benefits to both shareholder grou ps. With the LTG merger, the company plans on becoming a dominant patent monetization company with the goal of being the Blackstone Group LP (BX) of the sector. Ever since the old Petrohawk management team purchased Ram Energy and invested millions of dollars last December, analysts have suggested buying the new Halcon Resources Corporation (HK). Unfortunately, unless investors bought during the first two days, anybody holding now is under water. In essence, any investors buying the stock this year have lost money. The domestic land E&P firm is building positions in leading unconventional shale plays, such as the Eagle Ford, Bakken, Utica, and the Tuscaloosa Marine. Investors now though get the option of following those insiders who made significant purchases in the $5 area last week. Oddly though, after a strong surge Tuesday on the news of the insider purchases, the stock has started sinking again. Should investors jump in with the insiders or dump the stock? 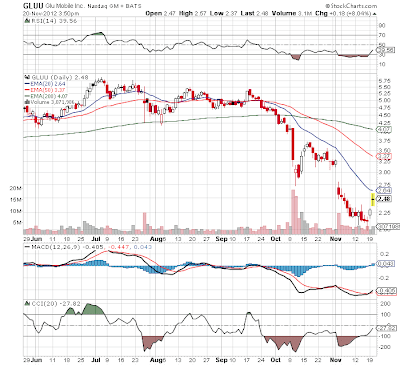 Glu Mobile (GLUU) has absolutely plunged the last few months as the mobile game developer struggled with a slew of failed games during Q3. Unfortunately investors continue to forget that short-term failure shouldn't lead to the outright collapse of the stock. Long-term valued can still exist. The company still expects over $100M in revenue next year and appears to be setting up a premier development platform. So why do investors continue to sell growth stories into oblivion? This company reached a market value below $150M yet recent deals for fast growing companies have hit 10x revenue. The stock slumped from $5 to $2 based on the game failures during Q3 that lead to 5 games being delayed during Q4 to allow the new President to review the monetization plans. Westport Innovations, Inc. (WPRT) remains a leading way to invest in the transition to natural gas as a transportation fuel. As previously noted, the market is no longer impressed with the growth rate of this once market darling. The company expects to benefit greatly from the building of the natural gas highway by Clean Energy Fuels (CLNE) and a new engine from the Cummins Inc. (CMI) joint venture, though in both situations the catalyst remains months away. The company is a global supplier of proprietary solutions that allow engines to operate on clean-burning fuels such as compressed natural gas (CNG), liquefied natural gas (LNG), hydrogen, and renewable natural gas (RNG) fuels. On first thought, the announcement by TPG-Axon that SandRidge Energy (SD) should fire the CEO that founded the company and brought it to this position seemed ridiculous. After more research, the investor might just have a point. The activist investor submitted a letter last Thursday arguing that the Board of Directors should be realigned and the CEO should resign. SandRidge is an oil and natural gas exploration and production company that primarily focuses on the Mid-Continent, Permian Basin, and Gulf of Mexico. CEO Tom Ward has become a prominent leader in the oil exploration field making it further unlikely that he will be ousted. He was an original founder of Chesapeake Energy (CHK) that left to start SandRidge. The combined experience suggests that he has the knowledge to make this company successful. Disclosure: No positions mentioned: Please review the disclaimer page for more details. When Windstream (WIN) reported earnings last week, investors took the stock down to 52-week lows over concerns the company wouldn't have the ability to pay the dividend going forward. The local telecommunications provider missed earnings yet again, but more disappointing is that capital expenditures continue to creep higher. In order to maintain that juicy 12% dividend, the company must produce enough free cash flow to cover the cash distribution. Lately that equation has come into question even with an increasing revenue base as capital expenditures have soared. Over a year after announcing accounting problems in the tax department, Weatherford International (WFT) continues to struggle to complete the restatement. For investors, the most boggling aspect of the tax restatement is that the company moved headquarters to Switzerland in order to reduce tax liabilities, yet the company continues to incur the highest in the industry. The international oil services provider guided to an effective tax rate of 45% for all of 2012. More importantly the guidance for 2013 is for the effective tax rate to drop to a more historical 34% rate. The real improvement will come in later years as the company finally benefits from expected reduced rates. So how should investors value the earnings of a company with temporarily high tax rates? The market spoke with dramatically lower stock prices to the tune of a 52-week low. A range of companies benefiting from this shift to mobile traffic continues to grow. The industries range from Advertising to Real Estate to Travel with varying degrees of success and profits. Disclosure. Long AAPL, GLUU, VELT. Please review the disclaimer page for more details. SodaStream (SODA) just released a new commercial today attacking the likes of PepsiCo Inc. (PEP) and The Coca-Cola Company (KO). As a long time investor in SODA my only hope is that it doesn't attract the angry of the sleeping giants. SODA doesn't have the balance sheet to fend off these companies yet. Definitely an innovative story that should get the attention across regarding the ability to save the environment in the process of using the soda maker. One advantage to SODA is that the product can also be cheaper providing less incentive for PEP or KO to compete against them. 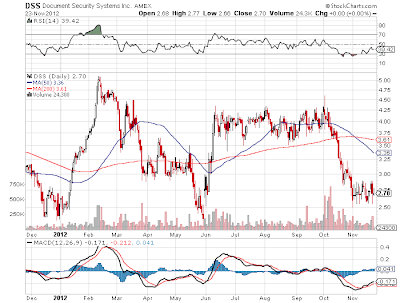 Disclosure: Long COP, DTV, GS, KSS, MSI, WLP. Please review the disclaimer page for more details. ConocoPhillips: Was Buffett RIght To Add Phillips 66? Back in April, ConocoPhillips (COP) split off Phillips 66 (PSX) to create a company focused on upstream exploration and production. The ultimate goal was to release the company from the regulatory and margin pressures common in the refining business of the new Phillips 66. A few months after the split, Buffett's investment arm of Berkshire Hathaway Inc. (BRK.B) famously increased investments in Phillips 66, to the surprise of most. The refining business has long been suffering due to low cost foreign imports and domestic regulations. Buffett and others though were interested in the potential of the chemicals and pipeline division. As we highlighted back then, the majority of the profits in that company will be derived from the refining arm for the foreseeable future. So was Buffett right to invest in Phillips 66? The Net Payout Yields model continues to rack up impressive gains with the 2nd year of being offered on Covestor completed on November 1st. The model has provided a 15.1% annualized return compared to the 9.4% return of the S&P 500 during those 2 years. The performance remains more remarkable considering the model was immediately 2% in the hole back in November 2010. As the Performance results show below, the model has been successful in outperforming the S&P 500 in every period tracked whether 2011, 2012 YTD, or the past 30, 90, or 365 days. The model continues to be a slow and steady overachiever. The model may not be exciting, but it sure provides solid returns for a volatile market over the last 2 years. Investors wanting to sleep well at night should review the below Risk Metrics. As mentioned prior, the 3D printing sector has appealing growth potential, but the valuations of the two main players have typically been at elevated levels. The stocks of 3D Systems (DDD) and Stratasys, Inc. (SSYS) were expensive in spite of the fast growth rates until the September swoon. Now 3D Systems can add a short attack to the equation. The company is a leading provider of 3D content-to-print solutions including 3D printers, print materials and on-demand custom parts services for professionals and consumers alike. As written back on October 10th with the stock around $34, the sell-off provided a good entry point into the stock and the sector. A great Q3 earnings report helped counter the short theory and sent the stock surging to over $42 before the market closed for two days. The mantra continues to be that "cash is king." This mantra highlighted companies with cash on the balance sheet and generating strong cash flows, but it placed no emphasis on the use of that cash. Now after years of absurdly low interest rates, those companies hoarding cash might soon find out that using that cash for an accretive deal might rule the previous king. Prior to the market open on Monday that never happened due to Hurricane Sandy, Riverbed Technology, Inc. (RVBD) announced the deal to purchase OPNET Technologies, Inc. (OPNT) for cash and stock. The deal provides Riverbed with more access to the application performance management (APM) sector and ties in perfectly to extend the network performance management (NPM) of Riverbed's Cascade product. The poor man's Caterpillar Inc. (CAT) appears to have finally turned the corner. Terex Corporation (TEX) continues to report solid margin expansion even with limited sales growth. In the past, the company routinely reported substantially lower margins than the market leader even in high growth periods. The company is a diversified global manufacturer focused on aerial work platforms, construction, cranes, material handling and port solutions, and materials processing. While investors might have been disappointed with lower than expected sales during Q3, the more important number remains the solid margin expansion. Generating free cash flow and improving the balance sheet is more important than growing revenue. Disclosure: Long TEX and MTW. Please review the disclaimer page for more details.